I could not have been more than 10 years old, standing gangly-legged in a stretched out one-piece bathing suit on the hot sandstone. My father was, and still is, a boatman at heart and he and my mother had packed up our old suburban with a week’s worth of food, two windsurfing boards, several inflatable pool toys, and our two border collies. We’d made the trek from Ketchum, Idaho to Bullfrog in southern Utah, one of a few big marinas on Lake Powell. I distinctly remember how hot the rocks were beneath my bare feet as I hopped out of the car, and how warm the murky water was that I splashed around in to keep cool as my parents loaded the goods from the car into the houseboat that was ours for the week. Lake Powell was new territory for us, and boating in the desert seemed strange and foreign to me. My dad, armed with maps that he’d studied for weeks beforehand, was ready to venture deep into the reservoir’s narrow, meandering canyons, looking for secret little nooks to stay the night, ancient ruins to explore, and vast sandy beaches where we could unload the dogs and toss a frisbee. At the time, I had no concept of anything existing beneath the water we motored across. Towering red and white sandstone cliffs seemed to rise out of nowhere, narrowing towards one another as we veered further away from the heart of the lake. What was above water was spectacular, and I was young and unsuspicious of the consequences of creating this watery playground. We explored ruins and slot canyons, found exquisite beaches, and passed by cliffs, arches and sandstone formations that left us in awe. I’ve read Edward Abbey’s rants on Glen Canyon. I’ve studied ancient cultures of the desert Southwest. I’ve heard many lectures on water policy and I’ve followed dam debates. I know that water levels are low and temperatures are high. But no amount of schooling or reading or conceptual grasping could have elucidated the sensation of sitting on a raft, floating down a canyon that used to be flooded with water—a distant section of Glen Canyon’s Lake Powell now reclaimed by a fully flowing river. Through a network of ambitious and adventurous friends in my now hometown of Salt Lake, I’d been introduced to Eric Balken, the director of Glen Canyon Institute (GCI), a non-profit organization dedicated to the restoration of Glen Canyon and a free flowing Colorado River. Balken had invited a group of 50 people to join him in celebration of the organization’s 20th anniversary. On Earth Day weekend in April, 2016, we gathered at the Hite boat ramp in blustering winds that drove sand into our faces and brought whitecaps to the river. For the past 50 or so years, the Hite boat ramp’s significance was associated with the end of Cataract Canyon on the Colorado River, a notorious section of wild whitewater. It also signified the end the river’s natural flow and the beginning of Lake Powell reservoir. But on this day it was something entirely new, or maybe historic in this case; it was the start of a float down the newly free-flowing section of the Colorado River in upper Glen Canyon. The seven mile stretch from Hite to Farley Canyon that we were about to float (or, in this case, paddle relentlessly against a whipping headwind) isn’t the most exciting, remote, or aesthetic stretch of the Colorado River, Balken explained, but the significance of the journey could not have been more noteworthy, and you could see it on his face as we pushed the boats from shore. The Colorado River meeting Lake Powell at Farley Canyon, illustrating water levels in 2014. At full capacity, Lake Powell extended 35+ miles upstream from this location, into the heart of Cataract Canyon. Photo credit: Ecoflight. GCI was founded in 1996 by Richard Ingebretsen, along with the help of legendary conservationist David Brower. Ingebretsen, MD, PHD, is a physician and faculty member at the University of Utah School of Medicine and Department of Physics, and is the founder and President of Utah Wilderness Medicine. He stood on the riverbank in heavily worn sandals, a t-shirt that had seen many desert trips, and an old and loosely fit baseball cap. Ingebretsen and Balken, who has been working for GCI for over ten years, share more than just desert dirt-covered shirts and childlike grins in common; they’re both big dreamers and optimists with sharp intellect and enormous dedication to this cause. 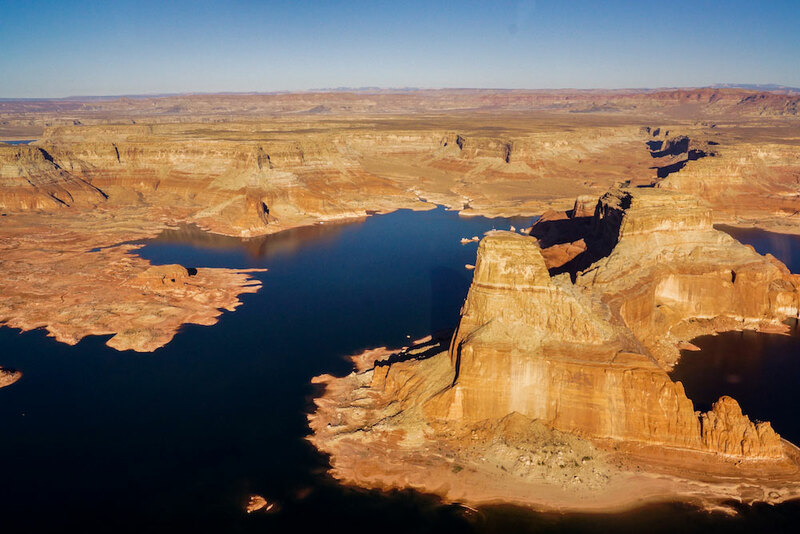 “We could see all of Lake Powell drained and returned to river in the next fifteen years,” Balken said to me, which, when you think about draining the 13.7 million acre feet of water that currently fill Lake Powell, is an ambitious goal. Glen Canyon Dam, which holds back the Colorado River and is the reason Lake Powell exists, was completed in 1963. “It is considered by many to be one of the biggest environmental mistakes in our nation’s history,” says Balken. Built for the purpose of water storage in the upper Colorado River Basin, the dam was approved by congress in 1956 under the Colorado River Storage Project Act (CRSP). The decision was made to dam Glen Canyon after a series of negotiations with Brower, also the executive director of the Sierra Club at the time, who was fighting a proposed dam on the Green River upstream in Dinosaur National Monument. The Bureau of Reclamation and Brower struck a deal: a dam would not be built in Dinosaur as long as the Sierra Club would not fight the CRSP and a dam at a remote location downstream near the Utah – Arizona border. When Balken talks about Glen Canyon you can hear one part river rat and one part canyon eco-nerd in his voice. He’s frustrated, like many other river-goers, to know that a stretch of river that could very well parallel the Grand Canyon in scenery and invigorating experience, is underwater. But he has done his research too, and together with GCI he has spearheaded ten scientific studies on the region. 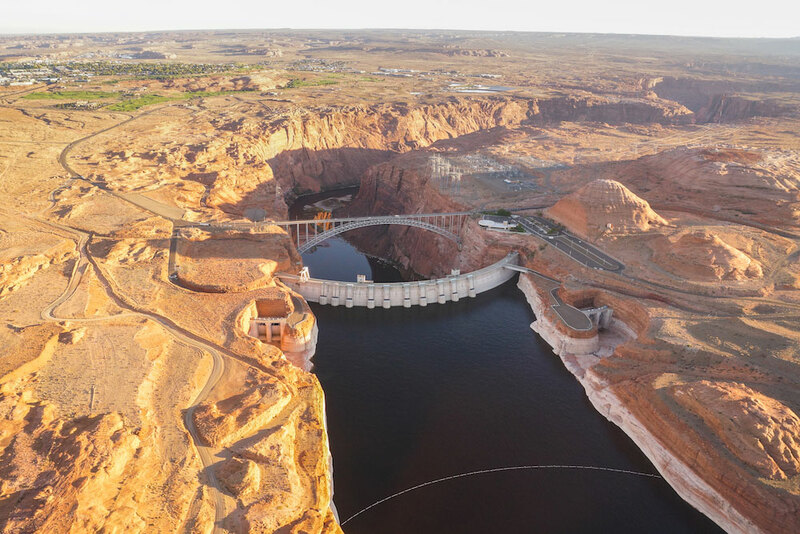 When Brower joined forces with Ingebretsen to found GCI in 1996, their mission was to restore the flow of the Colorado River through Glen Canyon and downstream Grand Canyon, with the initiative to move water stored in Lake Powell downstream to Lake Mead. 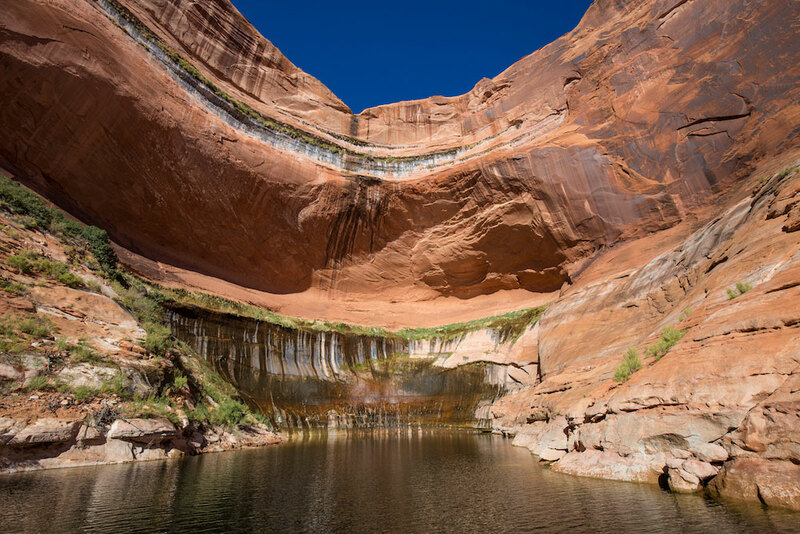 Dubbed the “Fill Mead First” proposal, the group hoped their efforts and extensive research would allow the otherworldly landscape of Glen Canyon to come back to life. It is easy to get lost in Balken’s steady stream of information and convincing argument for draining Lake Powell, but I had to remind myself that I had been one of those house-boaters floating around on the refreshing Colorado River water that filled the intricate crevasses of Glen Canyon. I had really enjoyed the experience, but I wasn’t sure if I should admit that as we paddled past a defunct marina across from the Hite boat ramp that now sat hundreds of yards away from the water line—a dried up and abandoned reminder that times are changing no matter what side of the argument you’re on. Climate change is the other factor behind the region’s water woes. 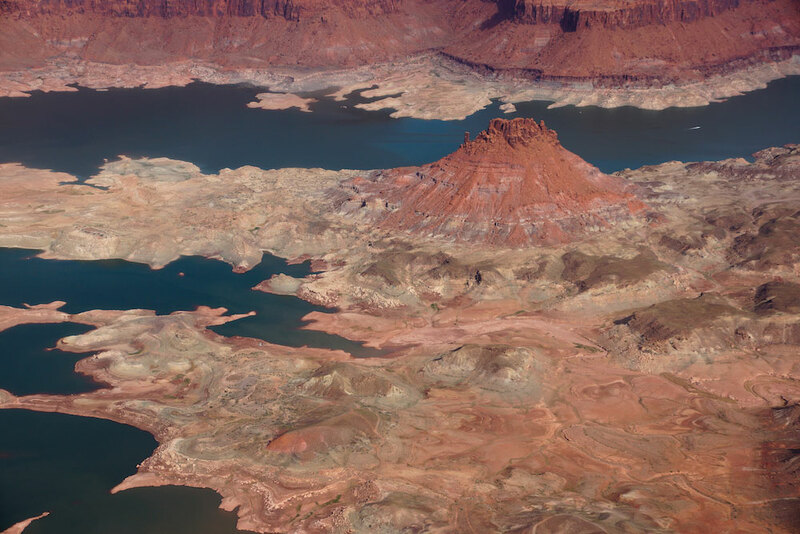 Several climate studies over the past decade have suggested that a warming climate is reducing spring runoff and may drain both Lake Powell and Lake Mead within 20 years. This spring, Lake Powell was 46 percent full, while Lake Mead, its downstream counterpart, was a mere 37 percent full. This year, and the two years prior, Lake Mead has dipped to its lowest point since it began filling in 1936. Water storage between the two reservoirs has dipped to its lowest combined amount since Lake Powell began filling in the 1960s. 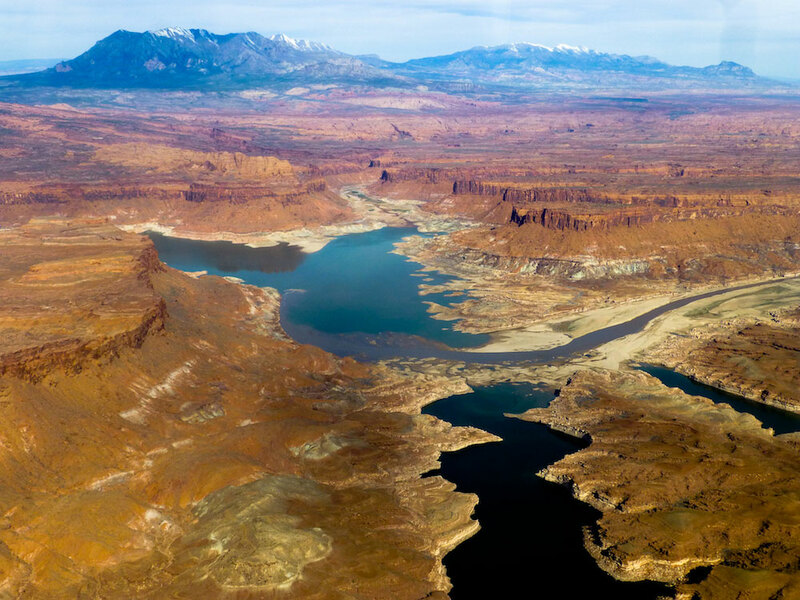 They may have been a few years before their time, but Ingebretsen and Brower’s “Fill Mead First” campaign may be the first step in the right direction for those who want to see the Colorado and Glen Canyon restored. From where I sat on our 16-foot raft at the bottom of the canyon, it’s obvious the water is going somewhere—I guess it’s just a matter of where it goes (or doesn’t go) now. Even when you’re talking about tens of millions of acre-feet, water is limited, which in this case is both a solution and a problem. On one hand, many consider it a great success to see Glen Canyon emerge from the depths of Lake Powell, letting the Colorado flow a little deeper into its native territory. On the other hand, its emergence is due to great water loss and a drought that’s impacting more than just the American Southwest. So what do we celebrate? We were likely the biggest group to float this section of Glen Canyon in 50 years—since the flooding of Lake Powell took over the natural flow of the river. We paddle seven miles downstream and pulled off into Farley Canyon, where we draw our boats from the river as its flow slowed to a near stillness. We celebrate doing something that not many people have done in the past half century; we celebrate seeing canyon walls that were new to the sunlight and roaring winds. We celebrate the company of fellow river travelers and passionate individuals who do want to see a change happen, despite the complications of the debate.